Location varies; check with information desk upon arrival for exact location. Drop-In Discoveries stations are available at Tamarack Nature Center every Saturday morning from June - September and the first Saturday of each month from October - May. Stations are open from 10 a.m. to noon. Visitors are free to come and go from the programs as they choose, and no pre-registration is required. Stations are open to all ages; please note that children should be accompanied by an adult. 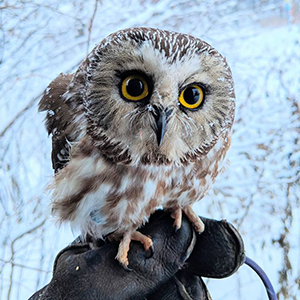 Drop-In Discoveries are led by Tamarack’s volunteer Discovery Hosts and feature up-close visits with live animals, including Tamarack’s resident owls, snakes and salamanders. Participants also get hands-on experience with touchable artifacts, like skulls and skins, and sample edible treats from the Discovery Hollow garden.